Yesterday we brought you the news of a Chinese stunt driver who smashed the record for the world's tightest parallel park. Now that same driver, Han Yue, has lent a hand in assisting fellow pro wheelman Zhang Shengjun topple another world record. Specifically, Yue climbed aboard a Mini hatchback and proceeded to drive along on two wheels, while Shengjun performed donuts around him in a BMW M4 Coupe. The aim? To complete the 'most donuts around a car driving on two wheels in one minute' – because apparently that is an actual thing. A rather contrived record, then, but one that requires extraordinary levels of car control from both parties. 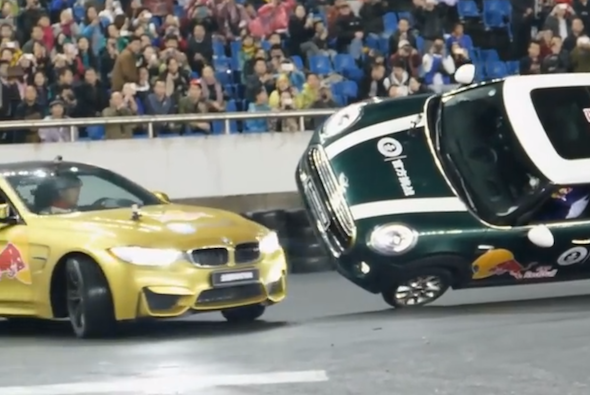 However, as the video below shows, neither falters under the pressure, and the record is claimed after ten successive laps of the precariously balanced Mini – ensuring Shengjun's place in the history books. Click play below to watch the record attempt as it happened.